Milkshake! Brand New Besties DVD is the latest release from Abbey Home Media available from Monday 23rd October with over two hours of fabulous fun, magical mischief and awesome adventure. Whether it’s keeping a secret, learning to compromise, solving a problem, searching for clues or planning the best sleepover ever, our heroes put their friends firmly first! PAW Patrol – In ‘Pups Save the Paw Patroller’, Mayor Humdinger has swiped the PAW Patroller! The pups need to get it back and save that meddling mayor too. Digby Dragon – In ‘Disappearing Spell’, Digby’s friend Sprite comes to visit, and Fizzy casts a disappearing spell on her. When Grizel and Mungo take Spellbook it seems impossible to magic Sprite back again. Bob The Builder – In ‘Where’s Pilchard?’, when Muck has to shoo Pilchard out of his way, she suddenly vanishes. Leo and the machines run around trying to find her before Bob realises she’s disappeared. Shimmer and Shine – In ‘Flying Flour’, the girls bake magical flying cookies, but Zeta and Nazboo sneak in to steal the flying flour. Fireman Sam – In ‘Best Sleepover Ever’, Norman, Mandy, Sarah and James are having a sleepover at Mandy’s house. Norman is determined that it will be the ‘Best Sleepover Ever’. Simon – In ‘The Secret’, it’s Gaspard’s birthday. Simon has found out where Mummy has hidden his brother’s present. But Simon has sworn he’ll keep it a secret! Poppy Cat – In ‘Underwater Picnic’, when Zuzu and Alma both arrive with plans for the group, Poppy teaches them the art of compromise. They set off in the submarine for Seaweed Sea to look for the speedy turtle and have an underwater picnic. Floogals – In ‘Project Caterpillar’, Boomer has become very fond of the 3 stripy caterpillars the kids are keeping in the shed. When one vanishes the Floogals stake out the container they are in to see if they can solve the mystery. Olly the Little White Van – In ‘Bad Luck Olly’, Olly is going through a run of terrible luck. The more he tries to help people the more things go wrong. Help comes from the most unlikely place as Bazza helps him relax and do what comes naturally….Helping! Puffin Rock – In ‘Mossy Impossible’, Oona is in danger. She’s tangled up in fishing twine near Seagull Cliff and the seagulls will be back soon! Mossy and Bernie try to free her, but they need help from Mama and Papa Puffin. Noddy, Toyland Detective – In ‘Broken Crystal Memory Game’, Noddy needs to find out who broke the Crystal Memory Game before the start of the Daredale Challenge Obstacle Race! Thomas & FriendsTM – In ‘Toby’s New Friend’, Philip spots Toby and assumes that he is a diesel boxcab just like him. Convinced that they will become best friends, Philip rushes up to introduce himself, but Toby finds him rather overwhelming. H&A are known for their vast array of kids character toiletries and Christmas time is no exception, with their vast array of children’s gift sets available in a number of different ranges. We received a selection for Miss M and Mister B to enjoy this Christmas time. For boys I love the Thomas set with sponge, fizzers, crayons and stencils. My two love drawing on the bath so the Thomas stencils should be lots of fun to use and keep them entertained. Mister B loves pirates, so Jake and the Neverland bath treats will always be a hit with him. The Tub Tints telescope is a fun idea, coloured bath salts that change the colour of the water and once the telecscope shaped bottle is empty, rinse it out for pirate fun in the bath with your own pretend telescope! There’s also fun to be had with the walk the plank set which includes a suction plank for the side of the bath that you can walk your fingers or any little bath characters you have down until they land in the water. For girls the Juicy Lucy range is really pretty and perfectly aimed at the almost 7 year old Miss M. The cupcake bath fizzers are sure to be a massive hit with Miss M who will adore using one of these in her bath. The fairy wash bag contains lots of goodies such as bath puff, hair bobbles, bubble bath, shimmer lotion and bath confetti – plenty of exciting things for a young girl. The final set with fizzers and a magic flannel is a perfect extra, all children love to watch their flannel grow in the bath, and something that can be used again and again. 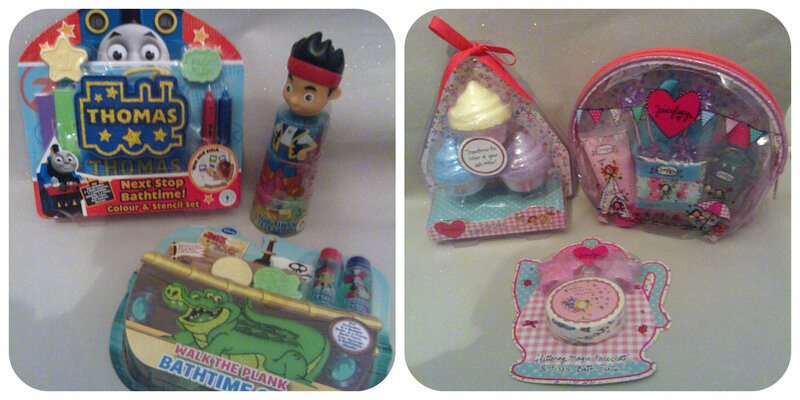 I love all these ranges from H&A, the perfect bathtime gifts for children. There are plenty of other character giftsets available such as Frozen, Me to You, Disney Princess and Doc McStuffins, so something to suit everyone. What gift range will you buy for your child this year? All reviews are my own and my family’s opinions and we received the bath gift sets in order to write the review.